Master tactical dice battles! Enjoy the clever combination of skill and luck. 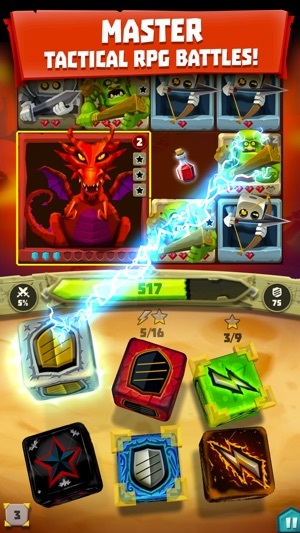 Dice Hunter is a turn-based role playing game with collectible dice. Play now for FREE! 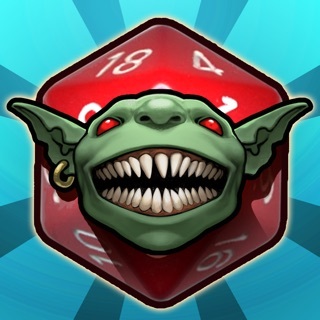 Become the Dicemancer and assume the incredible ability to capture creatures into dice. Hunt dice and wield them to save the Land of Chance from the marauding minions and evil allies of the wicked Snake Eyes. Play with the BEST DIGITAL DICE! 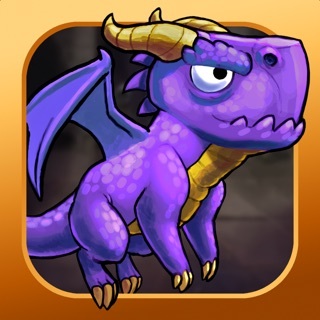 Battle CASCADING MONSTERS in challenging puzzle-like levels! LOCK and ROLL your dice to match magical symbols! 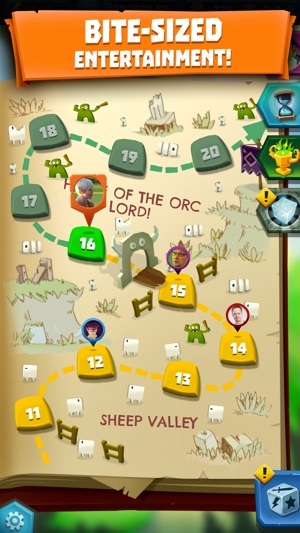 COLLECT dice and build teams to optimize your strategy! EVOLVE your dice and use their SPECIAL POWERS for tactical advantage! 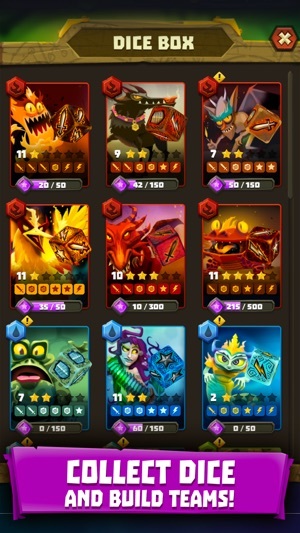 Join the DAILY TOURNAMENT to compete against friends and strangers! 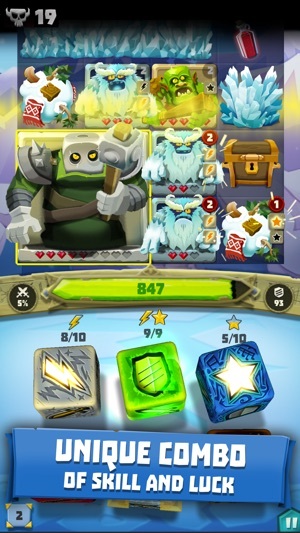 This game is free to play, but offers in-app purchases. SEASONAL EVENT: Wade your way through the parades of the Spring Festival and get your dues in this limited-time event. Do you have what it takes to make it through the New Year’s festivities? BUG FIX: UI should layout correctly on iPhone 8. This free-to-play experience has set a new high water mark in what you should come to expect from a game. Aside from the cool, easy to learn, pick up and play mechanics that thoroughly reward thoughtful, strategic play, at its heart, it’s just plain fun. At the end of the day, that’s what’s you’re looking for in a game, no? The colorful art is stylish and cohesive with high amounts of polish. The sound effects and music are suitable and are thematically solid. A wide variety of modes, which open up as you progress, provide myriad avenues with which to further gather resources and experience to satisfyingly increase the power of your dice homies, in turn, raising your own personal power. On this front, the patient will find that monetary gains from the bulk of completed levels can be doubled merely by watching a short video. 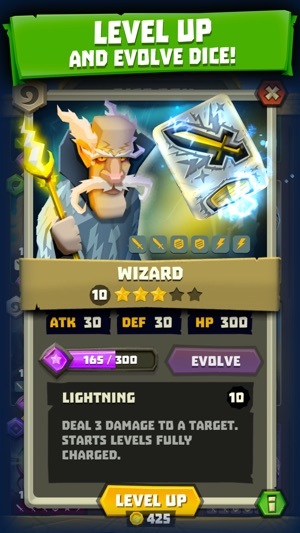 This most often proves to be totally worth your 15-30 seconds, saving you from spending the generously awarded diamonds (One of the two in-game currencies) to be spent on hunting and evolving your cubic army. As previously stated, Dice Hunter is loads of fun, and doesn’t constantly assault you with asking for money, while not hiding the game behind an obnoxious pay wall. It’s simply, the best, most engrossing, most fun mobile game this gamer has stumbled across in a very, very long time. Bravo, Greener Grass. Good on you. But this game is amazing! The artwork is awesome, gameplay is easy to pick up, and the idea is something new. It’s refreshing to see something that isn’t a ripoff of something else on the top charts. The tutorial is short, yet in depth enough to help you learn. Gameplay itself is super simple, yet there is enough to it to keep you from getting bored. It can be mindless or strategic and I love the dice collecting! Each die does something different and you make a “team”, much like any other rpg out on the App Store right now. Different combos will have different strengths and power, and there can be a bit of a grind to level up so you can level your dice. The game doesn’t feel like you have to pay to get anywhere, either. I’m obsessed after just a couple of hours and I can’t wait to see what is added in the future. Great job, devs! Looking forward to seeing what you can do with this awesome idea! A fantastic game that is easy to learn but remains tremendously fun. Don’t forget to pick up the daily free dice shards in the store. The use of ‘dice’ in the game as a singular noun (instead of ‘die’) is a little jarring for my grammar sensibilities, but that is obviously minor. My only significant negative comment is that the app consumes a large portion of my battery life when left running in the background. I am guessing that the app is syncing with the server an unnecessary amount. So, as long as you kill the app between sessions, you’ll have a great time with this product.